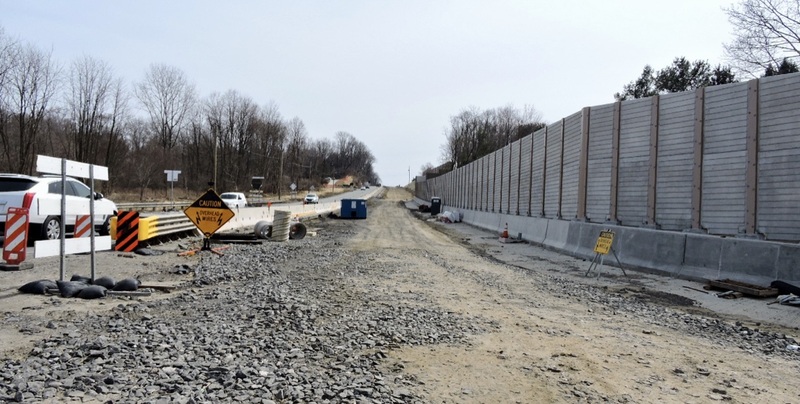 April 2019 — Stage 1 construction on the eastbound side of U.S. 322 (Conchester Highway) will wrap up in late spring when crews complete paving of the two new eastbound lanes east of Fellowship Drive and finish intersection improvements on the eastbound side of the highway. By mid-May, the entire 2.6-mile project area will be in Stage 2 construction to widen the westbound side of the highway. 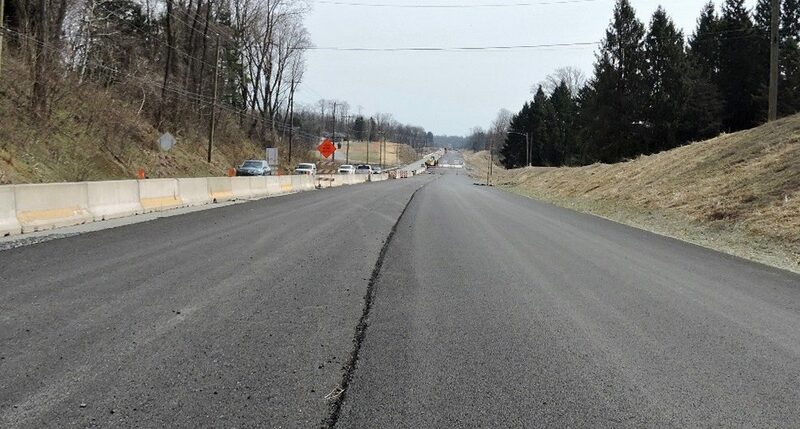 In January, construction of almost a mile of new eastbound lanes finished and two lanes of traffic were shifted onto new pavement between U.S. 1 (Baltimore Pike) and Fellowship Drive. The contractor then began Stage 2 work to widen the westbound side of the highway at the western end of the project. 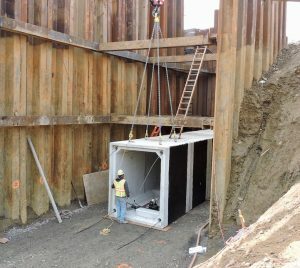 Following the shift, crews began installing parts of the stormwater drainage system on the westbound side, including construction of a long pre-cast box culvert (right) east of Evergreen Drive. 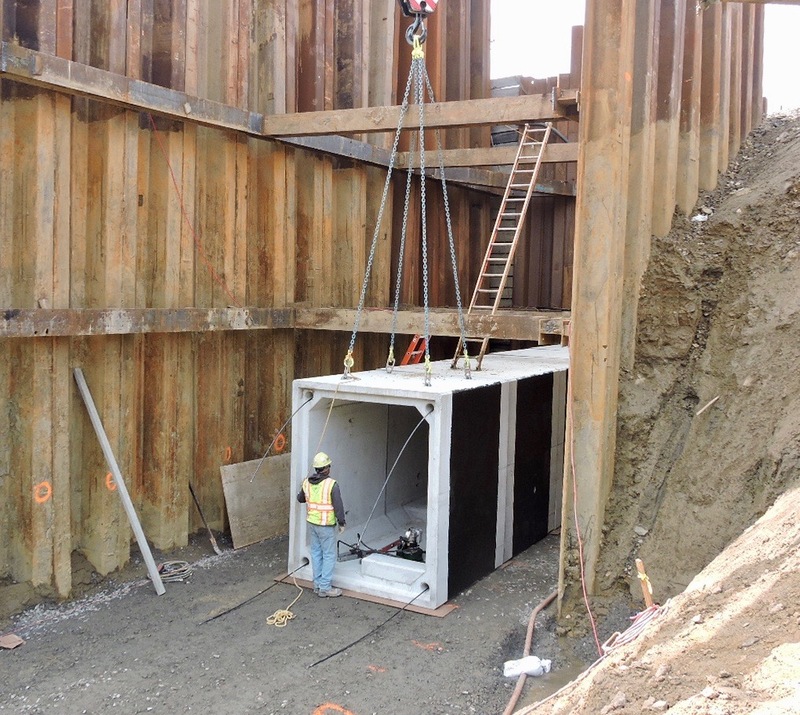 The culvert will carry runoff under the roadway to a large drainage basin on the westbound side of the highway. Construction over the winter also completed installation of a relocated gas main on the new bridge over the Webb Creek (left), allowing crews to finish preparing the eastbound side of the new structure for concrete deck paving in April. 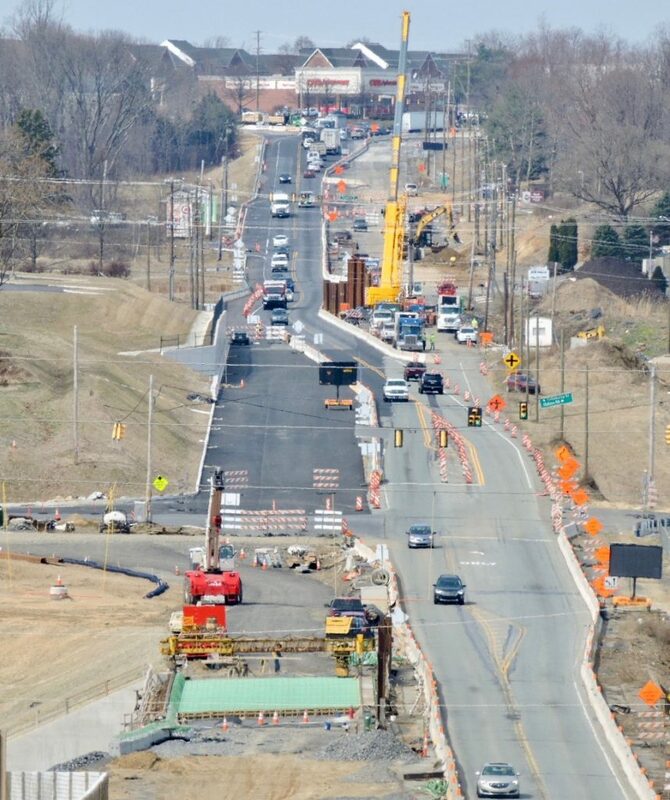 The eastbound section of the new bridge over Smithbridge Road is in place. East of Fellowship Drive, heavy equipment operators over the winter completed excavation on the hillside near Station Road (south), establishing the last segment of the new eastbound footprint in the project area. Crews also finished the long sound wall along the eastbound side east at that location (below). This spring, the new eastbound lanes in this area will be paved, along with any other gaps in the pavement, to complete the two new lanes of eastbound roadway. 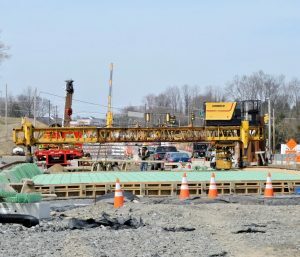 A lane of eastbound and westbound traffic will then be shifted onto the new pavement east of Fellowship Drive, allowing work to be expanded over the spring to include excavation, the placement of additional drainage pipes and inlets, bridge and structure construction, grading and, eventually, roadway construction along the entire westbound side of U.S. 322 (Conchester Highway). Westbound widening is scheduled to be completed in early 2020. A third-and-final stage will rebuild the middle of the highway over the remainder of 2020 to complete the Section 101 project. 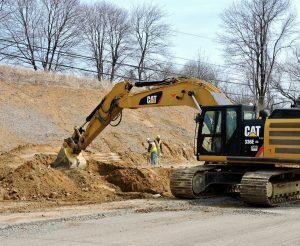 During all remaining construction on the $62.6 million Section 101 contract, PennDOT will maintain a lane of traffic in each direction on U.S. 322 (Conchester Highway) during peak hour travel. Motorists may find periodic flagger-controlled lane restrictions at locations across the work zone on Mondays through Fridays from 9:00 AM to 3:00 PM, and from 7:00 PM and 6:00 AM, for various operations as construction advances along the corridor. Under the current contract, PennDOT is reconstructing and widening the roadway and upgrading intersections and traffic signals on 2.5 miles of U.S. 322 (Conchester Highway) from U.S 1 (Baltimore Pike) to just east of Featherbed Lane/Mattson Road near Clayton Park in Concord Township, Delaware County. 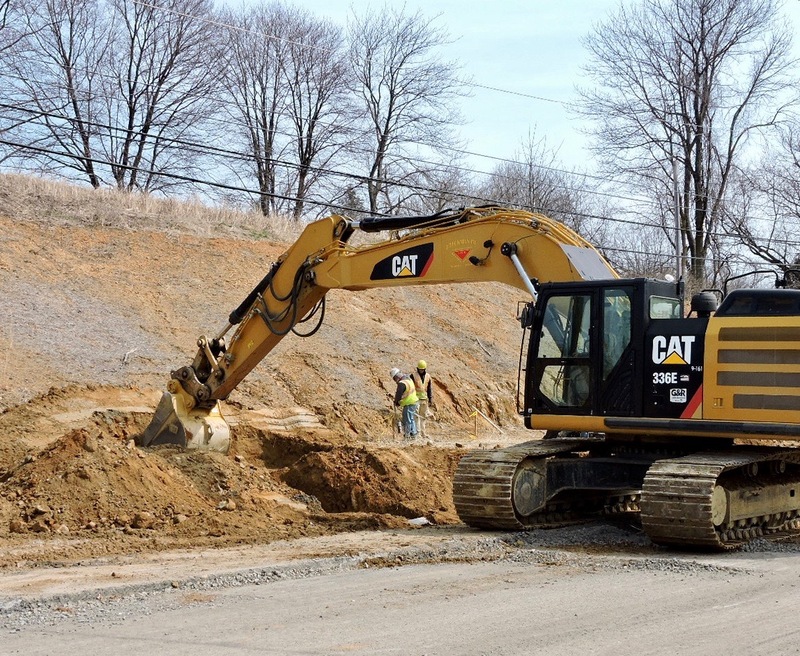 The work is the first of three PennDOT construction projects that will improve travel and safety on a 6.7-mile section of U.S. 322 (Conchester Highway). Design engineering continues on the second half of the project east of Clayton Park Drive, Section 102. Section 102 will improve the highway and its intersections and interchanges from east of Clayton Park Drive to just east of Route 452 (Market Street) in Bethel and Upper Chichester townships in construction that is projected to begin in late 2020. 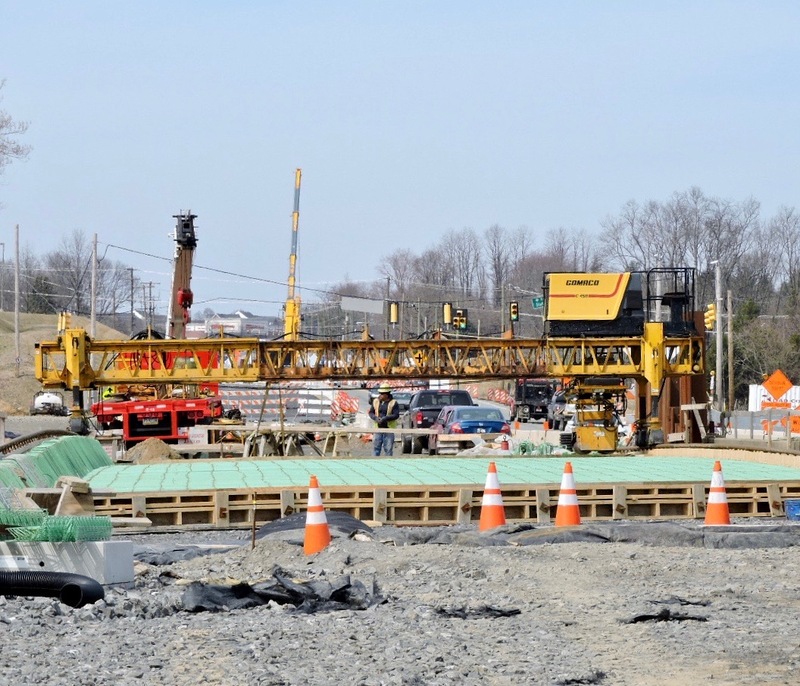 A third corridor improvement contract, Section CSX, to replace the U.S. 322 (Conchester Highway) bridge over the CSX railroad and Bethel Road and complete other improvements to the adjacent Bethel Road Interchange (Section CSX) is under design and not yet scheduled for construction.